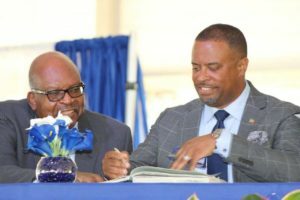 The Concerned Citizens Movement (CCM) party secured a solid win of four out of five seats over the Nevis Reformation Party (NRP), resulting in the Honourable Mark Brantley being sworn in as premier of Nevis the next day. The CCM, the People’s Action Movement (PAM) and the People’s Labour Party (PLP) comprise the highly popular government of National Unity, which was sworn in 34 months ago after a resounding victory in the federal elections Feb. 16, 2015. The candidates affiliated with Team Unity won seven out of the 11 federal seats.